Stanley lives with his obnxious older brother, harried real estate/account mother, and elderly grandfather who suffers from Parkinson's in California. He attends middle school, but it's becoming increasingly difficult for him to get through the day. His father is doing humanitarian work in Africa, and the boys miss him and his influence terribly. His best friend, Joon, keeps telling him to "be normal", and is hanging around with Dylan more than Stanley would like him to. The principal has frequent disaster assemblies to acquaint students with emergency procedures, but due to Stanley's sensory processing disorder, he finds the commotion and stress overwhelming. After one melt down, he finds himself in the nurse's office, and his mother finally tells the school about his condition. He is shown a room where he can go to decompress if necessary, which is very helpful. In the meantime, he and Joon are making plans to do a puzzle quest in order to earn VIP tickets to the local Comic Con. When Joon decides he would rather do this with Dylan, Stanley gets roped into participating with mysterious new neighbor, Liberty. Liberty is homeschooled, lives with her uncle, and has secrets in her past. The two do a very good job with the puzzles, and come very close to getting all of them when Liberty's worried mother descends to take her home. Dylan, despite his anxiety, struggles to finish, and is helped at the very last by an unlikely source. With Liberty gone, will he manage to patch things up with Joon in order to go to Comic Con together? Strengths: Stanley is a very intriguing character, and his friendships with Joon and Liberty, his ways of dealing with stress in his life, and his knowledge of classic comic books are all interesting. The plot moves along at a good clip even with all of the events occurring, and while puzzles are not my favorite thing, the comic book quest works nicely. Weaknesses: I could have done without the evil brother and his obsession with coyotes, and without the grandfather. There were enough other sad things going on, and I would have liked to have known more about Stanley's sensory processing disorder and ways he copes with it. I found it nearly impossible to believe that his mother had never told the school! 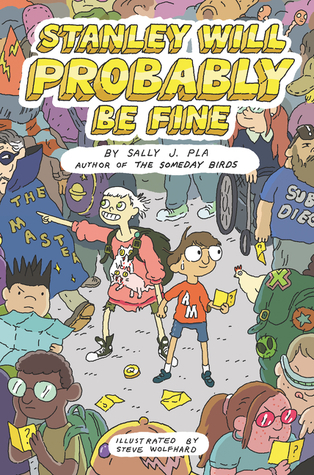 What I really think: I will probably buy this one, since it was funny and fast paced, but the cover isn't great. While this style works for Kloepfer's zombie books, I'm not sure about it here. 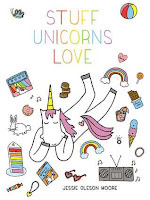 This comprehensive look at a wide range of things that interest unicorns is filled with everything tweens love-- cartoon illustrations, bright colors, and lots of rainbows. Cupcakes, ice cream, unicorn puns and sparkly stars make this a great handbook for friends to pore over on a rainy day and use to inform their own illustrations. Ever since the 1977 debut of Wil Huygen and Rien Poortvliet's Gnomes, there have been a variety of guides to characters that some unenlightened souls might consider mythical or fictional. While not an #ownvoices narrative, Moore has consulted closely with a unicorn friend, Sprinkle, to get all of the inside information on unicorn behavior. We find that while unicorns do favor cupcakes, they don't like chocolate sprinkles (ugly), they love donuts not only to eat but for use in recreational games. However, we find out that they are not fans of soccer, earth tones, and things that are dull, not sparkly, and interfere with their horn! Readers who enjoy novelty books like Ohlin's Peeps or the Zombies vs. Unicorns collection, unicorn novels like Bruce Coville's or Jane Yolen's, or popular culture guides to items like Hello, Kitty or YouTube stars will enjoy this light hearted and entertaining romp through all the sugary sweet sparkly goodness that makes unicorns "tick". Of course, as a Level Two Certified Magical Unicorn, I found the portrayal a bit one sided and simplistic. Older unicorns sometimes do tend toward navy and black, since keeping up a rainbow glamour can become wearing. We also tend to incorporate more fruits and vegetables as we age, since a constant diet of donuts and candy can wreak havoc even on unicorn health! Unicorn hoodie optional while reading this, but highly encouraged!